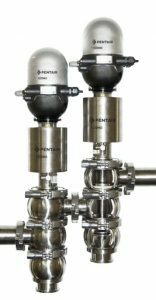 Non-Slamming Flow Diversion Device - R-Cap Process Equipment, Inc.
Pentair Südmo offers a Non-Slamming Flow Diversion Device that interfaces with the legal control systems for HTST operation. The machined body offers a rugged solution with a maintenance-free actuator that carries a 10-year warranty. The quick and easy testing procedure for inspectors allows for faster verification of operation. Our competitors’ products require complete disassembly of the valve for this testing. The upper seat is made from a durable PEEK material, while the lower seat is a sliding o-ring seal made from standard FDA approved seal materials (EPDM, HNBR, FPM). This rugged upper seat prevents frequent replacement and eliminates the need for frequent adjustment of the microswitch, while the radial lower seal allows for easy maintenance. The microswitch control top provides feedback when the valve is unseated and also when the seat is damaged. The valve set carries the 3-A symbol and meets the FDA guidelines for Flow Diversion Devices.